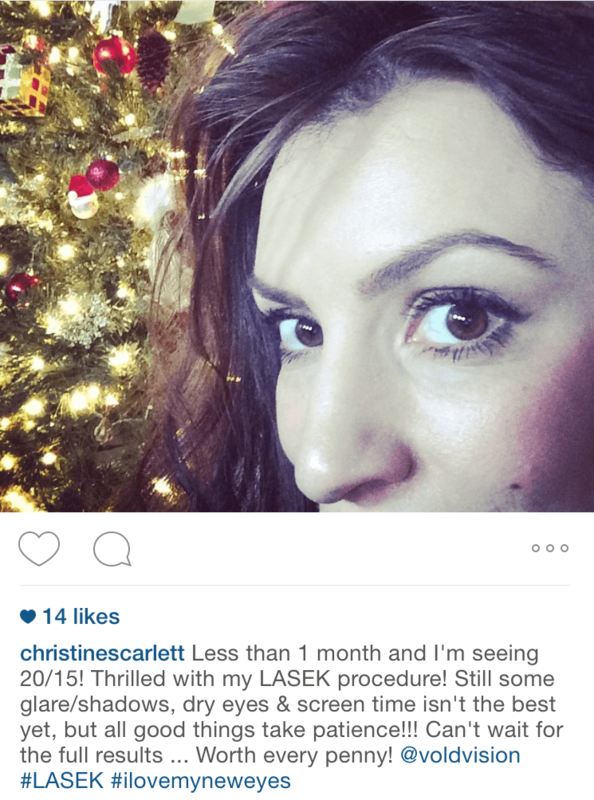 Here’s my play-by-play account of my experience with Laser Vision Correction. It is transparent and honest to hopefully give you a good idea of how it all works: start to finish! We now offer LASIK and the SMILE procedure, which have a MUCH quicker recovery! If I were to do it over again I would pick LASIK (I would not be a candidate for SMILE). The experience I share below would be very similar except for the post-procedure recovery time. 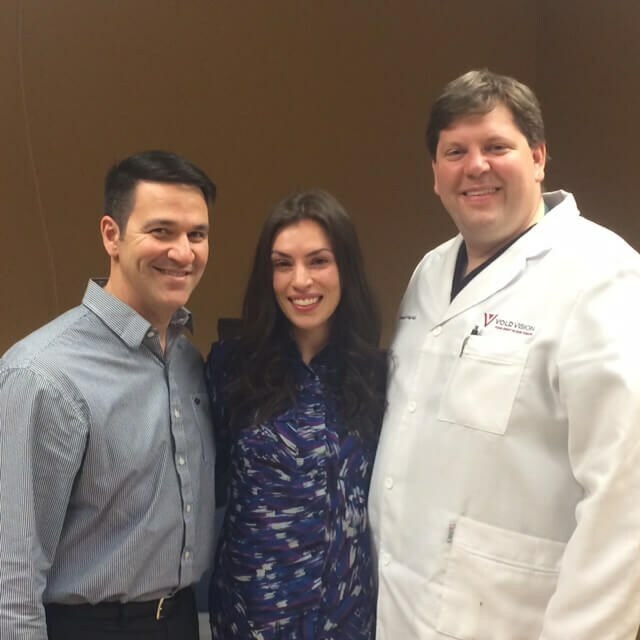 Most patients who choose LASIK or SMILE experience excellent vision and minimal discomfort within 24 hours. 3) they gave me an information brochure and FAQ sheet to read and told me the doctor would be in soon. This was great! READ THIS if you’re thinking of the procedure. Very informative & helps you schedule the procedure for the best time in your schedule (since I’m a girl, something like “No eye make-up for 7-10 days after the procedure” is a big deal in my plans (!) as well as having to be out of my contacts for 7-10 days beforehand. 4) Dr. McFarland came in next. He handles all of the Laser prep/measurements, etc and has actually had the procedure done so he was very informative. He let me know that I’m a good candidate and talked to me about the different procedures available as well as what the recovery process typically looks like. The recovery process for LASEK is something to factor in for work: Even though the main recovery is over the 4-day weekend (The procedure is done on a Thursday so you can take Friday off and return to work ideally on Monday) the following week will be tough if I have a lot of ‘screen time’ at work, so I’m planning to have a flexible schedule the following week. [Vold Vision now offers the latest in LASIK technology which offers patients a down time of as little as 24 hours!] He answered all my questions and is clearly both knowledgeable and cautious to make sure that his patients select the best procedure for their outcome goals. That was it! I scheduled my LASEK procedure and headed home. Excited, a little nervous (it’s my eyes after all! ), but excited! I feel informed and in good hands. Today I woke up and for the first time in forever I didn’t pop in my contacts. I dug out my old ‘back-up’ glasses – not great but they’ll do! 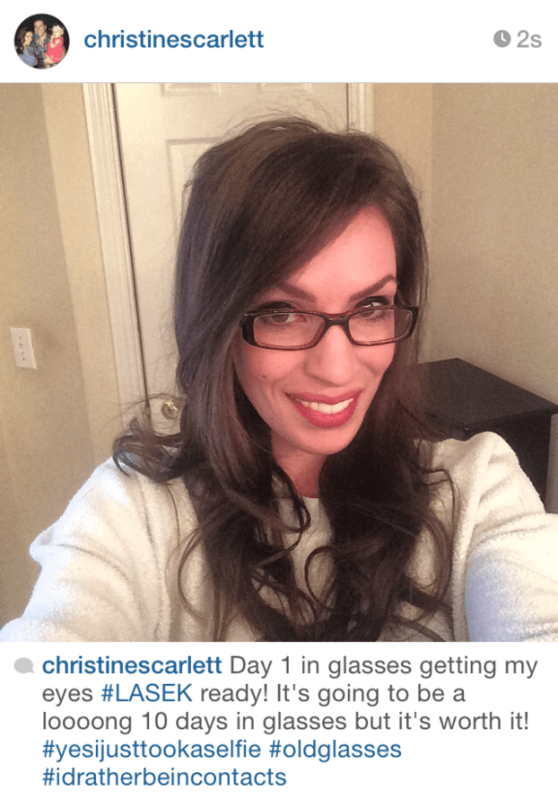 Talk about a good way to get excited about your LASEK – wearing glasses for 10 days! It’s worth it for sure, so I’ll hang in there! Here we go – count down to NO MORE CONTACTS AND GLASSES! One week in glasses and I’m ready – let’s do this! I have to say, the first several days brought on headaches since I’m not used to wearing them. I am taking all my vitamins to make sure my eyes are nice and HEALTHY for LASEK this week. I bought the Omega III’s at Sam’s (since I’ll be taking them for 6 months I might as well buy in bulk!) and yes, I bought chewable Vitamin C. What can I say? I like the taste of Vitamin C – my mom used to make us chew them as kids instead of candy! T minus 3 days until I get laser eyes! So excited! Just got home from my LASEK pre-op appointment. I chose to have it on the Tuesday before LASEK since you can’t do it on the same day. I can still work all day Thursday and just take off a little early for my procedure, then take off Friday. I am planning to return to work on Monday with the option of light duty if I need to take it easy. No big deadlines or events planned for next week, NOTHING planned for this weekend. I arrived and was escorted to an exam room by a technician. The tests began… these guys are thorough which is great! We want good measurements for that laser! Some of the drops burned a little but nothing bad. They gave me the consent forms to review while I waited for the Dr. The forms make it sound a little scary to be honest but when I asked Dr. McFarland about it he made me feel a lot better: A) he’s had the procedure done himself B) way more people have vision reducing issues from wearing contacts than anyone having LASEK (!) C) they just have to say all that for legal reasons of course. He said after all the final testing everything looks great to move forward! The technician gave me a information sheet and went over all the information and drops with me. They gave me coupons and a prescription for my Valium to go get and bring back with me to the appointment. 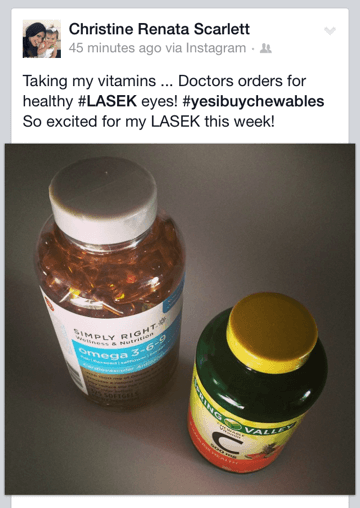 They answered all my questions and put me at ease: I feel prepared for LASEK! Let’s go! Here’s my play-by-play and personal experience with the procedure… Disclaimer: Individual results may vary! THE PROCEDURE: I arrived to the clinic and was instructed to take my Valium. You are then escorted to the surgery center and they put numbing drops in my eyes. The first round stung/burned a little but the next few rounds I didn’t feel a thing (which meant they were working!) after which we were escorted to the laser room. I laid down on the laser bed and TJ held my hand. seconds! He put some more drops into my eyes and some medicine and then laid a clear contact on my eye and it was done – on to #2! The second eye was ‘worse’ just because I knew what to feel for each step, but seriously I can’t believe how quick and painless it was! Uncomfortable, yes. Ready to get it over with, yes. But I didn’t have any pain! Incredible. I was in the laser room less than 15 minutes! Since I had such a small prescription, I didn’t have the ‘wow’ moment when I sat up – it was about the same as before I went in without my contacts – but I know for most patients this is a huge deal to instantly see so much better than when they walked in! If you have a really small prescription like me it will be more of a “this will be great once my eyes heal” type of thing, not “this is so much better now!” They checked my eyes to make sure everything looked ok and sent me on my way! I went home and the first thing I noticed was that I was VERY sensitive to light. The TV and my iPhone were too bright to comfortably look at. As the numbing drops wore off it felt like I had an eyelash in the corner of my right eye, but that was all the discomfort I felt. I pretty much ate and went to bed at 7:30p! I woke up at 11:00p and my right eye felt pretty uncomfortable – it felt like I’d left my contact in and it was really dry and wrinkled or something. Another ouch moment… I got up, put a lot of artificial tears in my eyes and made myself go back to sleep. I woke up and whatever I felt the night before was gone, felt great! Both eyes felt a little ‘gritty’ like I had an eyelash in my eye – or like I’d slept in my contacts – but I just followed all the drop instructions. Boy, those artificial tears feel great! VERY sensitive to light – I wore my sunglasses in the house and also a hat when I went outside. I could NOT watch TV or do much on my phone – Too bright, too much of a ‘glare’. Friday night I went to the mall to get out and wore my hat and sunglasses… looked like an idiot I’m sure but it was a nice distraction! AM: Still very sensitive to light and uncomfortable to watch TV. My eyes didn’t hurt, again a little scratchiness here and there. Off and on I’d get a cool washcloth (barely damp) and just lay my head back on the couch – this felt really good because it cut out all the light and was cooling for the slight burning sensation… It was a similar burning sensation to cutting onions but not as bad and without all the tears. Felt great though, got a lot of housework done! PM: I could comfortably watch TV and caught up on some DVR! AM: Sensitive to light but not as much! Same slightly gritty/burning sensation. Not painful and I forgot about it most of the time. PM: By afternoon the light sensitivity was gone (indoors) and the gritty/burning was pretty much non-existent! Was able to watch TV and catch up on my phone without the glaring effect! AM: Feeling great! TV, Laptop, Phone, great! I’d say it fluctuates – a kind of haziness comes and goes, but fully function able. No issues driving (haven’t tried night yet). PM: Went in to my post-op appointment and they said I was seeing 20/20. They took the bandage contacts out (didn’t hurt at all) and sent me on my way. NOW the glare came back for phone and laptop as well as a little bit of a dry/gritty sensation (felt like I’d left my contacts in too long). I pretty much struggled through short spurts of catching up on work emails and texts but avoided screen time as much as possible. 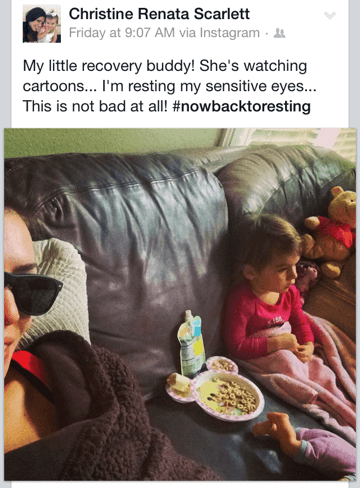 AM: Discomfort gone, just a little haziness that kind of comes and goes in my vision… eyes feeling pretty dry so just lots of artificial tears. Able to drive and see around the house, TV fine. Screens (laptop, phone) still difficult, almost a shadowy effect and difficult to see (had to get really close to read emails, etc.) so again, short spurts. PM: By the end of the day screen time was WAY better – got to catch up on a lot! Other than a little dryness and some fluctuating vision (haziness) I feel completely recovered! I can definitely see better than pre-procedure! Not quite as good as contacts (consistently) but almost!! Less than one week – so incredible. Was able to work on my laptop and iPhone with no issues other than lots of artificial tears and blinks. The first month was definitely up and down with fluctuating vision but my eyesight improved daily and weekly. Side effects such as halos and glare at night while driving, slight double-vision (reading, computer screen, street signs, etc.) dryness and occasional fogginess all went away for me at about 5 weeks. That’s when it hit me that I could see BETTER than I ever could with contacts or glasses. At that point the wow factor finally got me and I was a able to fully appreciate the results! Obviously, individual results will vary and all eyes heal differently based on your prescription, eye health, etc. 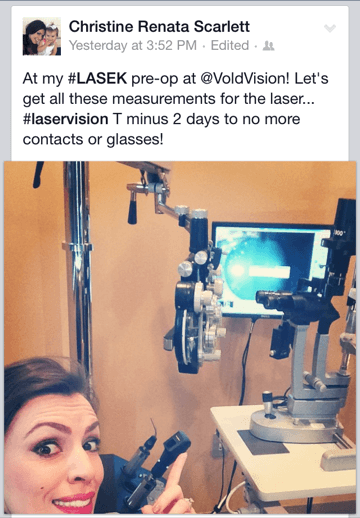 Dr. McFarland and Dr. Vold will help you know what to expect, but I hope my account has been helpful in the general process of Laser Vision Correction and recovery!